McLean, Virginia (CNN) - His car wasn't moving Tuesday, but President Barack Obama was gunning for Republicans. After testing a car simulator at a research facility here - an experience he equated to stepping into "Knight Rider" - the President let loose on GOP lawmakers, saying his opponents were standing in the way of any legislative fixes to the country's problems. "The American people have to demand that folks in Washington do their job," he said. "Do something: That's my big motto for Congress right now. Just do something." Despite his rebukes, Obama grudgingly acknowledged House Republicans had accomplished one thing - passing a measure that would keep money flowing to road and bridge projects when current funding dries up next month. The plan, expected to pass the House Tuesday, would supply nearly $11 billion for transportation projects, enough to last until roughly next summer. Obama said he'd support the measure. The President has been calling on Congress to develop a plan to replenish the dwindling Highway Trust Fund, which relies on a gas tax to finance road and bridge construction projects nationwide. The House measure is a far less ambitious proposal than the $302 billion package Obama offered earlier this year, which would pay for transportation projects by closing tax loopholes. "All this does is set us up for the same crisis a few months from now," Obama said during remarks at the Turner-Fairbank Highway Research Center, attended by about 150 employees of the facility. "Congress shouldn't pat itself on the back for averting disaster for a few months, kicking the can down the road for a few months, careening from crisis to crisis when it comes to something as basic as our infrastructure," he said. 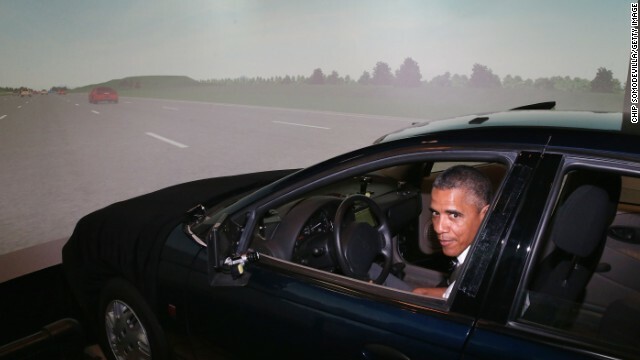 Earlier, during a tour of the facility, Obama stepped into the driver's seat of a simulator meant to demonstrate the types of "smart" vehicles being developed at the center, located minutes outside Washington. He's taken test drives as president before, but the President – who hasn't been behind a steering wheel regularly since taking office - said the experience made him a little queasy. "I think I had a little bit of a lead foot - I was starting to hit 90," he told a crowd afterwards. Luckily for GOP lawmakers, the car wasn't headed in their direction. Obama, as he has during recent speeches, mocked his opponents on Capitol Hill for bringing a lawsuit alleging he's overstepped his constitutional bounds by taking executive actions. "Their big idea has been to sue me. That's what they're spending time on - a political stunt that wastes America's time and taxpayer dollars," he said. "I'm not interested in playing political games." Oh they hate the educated, articulate black man, then he fixes their mess without them, issue after issue he still gives you a chance to help, but you just won't do it to save yourself, sad really. The Republican party absolutely must have the uneducated vote, they would be completely irrelevant without it, pretty bad when the very existence is dependent on stupidity. The Obama Parade of Lies just keeps on pouring out of the Liar of the Year. This is all he's done for 5.5 years, in between the 393 campaign fund raisers we have all paid to send him to. Of course, when all you got to show are failures after 5.5 years, lies are what you resort to. A black guy in a new car, pull him over! Hey , the GOP will be KICKED OUT of office in November , house AND senate. Their saying the SAME THING now that they said in 2012, and say HI to president Romney for me and Carl rove , the dancing CLOWN???? Obama should have done this years ago. One of the reasons Obama's poll numbers are so low is he keeps letting Republicans throw dirt on him without responding. He needs to fight back, and it seems like he's finally gotten the message. The Republicans' strategy has been to obstruct everything Obama tries to do, then whine about what a failure Obama has been. They never offer rational alternative ideas or even try to reach a compromise. Obama needs to keep hammering that message - it's the party of "no" that's making a mess of things, not him. Dwight D. Eisenhower is shedding tears about one of his biggest Legacies,The Interstate Highway System, rotting before our eyes AND the Republican Party having absorbed all the misfits that fled the Dem. Party since LBJ, as he predicted, signed Civil Rights & Voting Rights Acts. when is obama going to show up to work??? it's been 5.5 years now. can we please get some work out of this clown? all he does is this stupid stuff and then attack and ridicule the very people he needs to work with to get something done. this guy just doesn't have a clue or simply doesn't give a damn or maybe he just doesn't want to really work, just act like a celebrity. Can somebody please tell this guy to do something besides these stupid photo ops? -freeze immigration for thirty years. Job-Train Americans. Dollar is going out of here. Stop it. Stop IT, medical people etc these guys are defrauding immigration. Obama personally blocks everything from the House, from even being brought up in the Senate. HE is the obstacle........personally........and no one ELSE! Gee the clown car isn't even real. A simulated car driven by a simulated pres.